A team started by Dr Adrian Travis is well on the way to making 3D television in the home a reality. An experimental set-up capable of producing monochromatic 3D images on a screen has already been put together and a more advanced system will shortly be available. 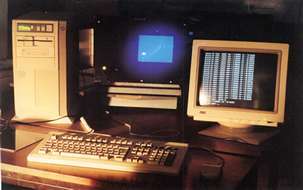 The challenge has been picked up by the University computer laboratory. They are adapting the television for keyhole surgery, where 3D colour images will make surgical operations using this technique safer and faster. Adrian Travis came up with the idea of how to produce a 3D image on a TV screen, using the principle that we see a different image of an object for every different position of our eyes. By presenting such different images in quick succession the eyes are led to see the image in 3D. As shown in the figure below the system works by dividing a view of an object into a small number of segments. The images of each segment, each revealing a slightly different view of the object, are then flashed in rapid succession on to a screen producing a 3D image similar to that perceived when looking at a hologram. The breakthrough in technology that has allowed this system to be implemented was the production of ferroelectric liquid crystals which have a fast response time compared to conventional liquid crystals. Liquid crystals switch from 'open' to the 'closed' state by rotation of the molecules which alter the polarisation. Ferroelectric liquid crystals are therefore used as shutters in this system and can be opened and closed to display the segmented image in under 100µsec. While each image is being displayed, a single 'shutter' in the display is open. That shutter must close and the next one open during the vertical flyback time of the cathode ray tube, ie between the end of one image and the start of the next. 'We are amazingly lucky here in Cambridge to have the combination of skills in Computer Science (Stewart Lang), liquid crystal technology (Prof Bill Crossland) and thin-film transistors, that have allowed us to make this breakthrough,' says Dr Travis. John Moore, a highly-experienced Research student, has also been a critical factor in the project's success, bringing with him extensive knowledge from his previous work with Flight simulator displays. Hightech firms that have the manufacturing capabilities for producing the endoscopes, which are required for the initial application in the area of keyhole surgery are also nearby. At present Dr Travis is confident that the team have a world lead but their competitors, particularly the Japanese are not far behind. The project is currently funded by The American Friends of Cambridge University with some collaboration from Thorn. Modules capable of producing monochromatic 3D moving images are already available, and work is going on to develop the system to produce colour images. Anyone interested in the use of this technique is invited to contact Dr Adrian Travis on (01223) 332735.